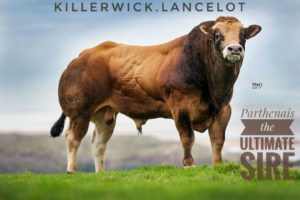 To keep up with the demand for the Parthenais James Duerden from Ulverston, Cumbria (Killerwick herd) went to France earlier in the year and selected nine maiden heifers for customers. 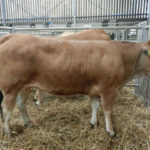 Of the nine heifers six have gone to form two new herds at Stoke-on-Trent and Oswestry. 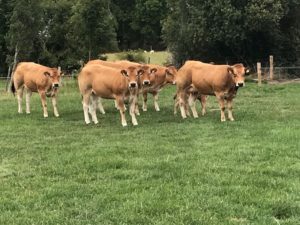 Member Paul Webber from Somerset (Portmead herd) and a fellow farmer have recently returned from Northern Ireland having purchased 14 heifers and a bull between them. 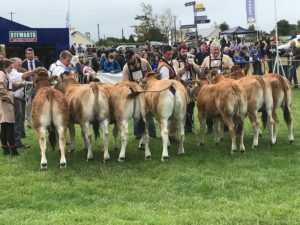 This is all great news for the breed, the members and the society, with Parthenais herds opening up in new counties, and the society looks forward to welcoming the new breeders. The 2016 RDS Champion of Champions Awards were presented in Dublin on 3 March to the best Irish cattle and sheep farmers from the 2015 show season. 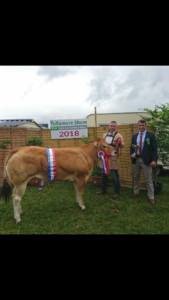 Gerard Harney’s Parthenaise cow, Actualite, pictured above, was crowned the 2016 Replacement Index RDS Champion. The replacement index allows farmers to easily identify sires that will be suitable to breed replacement heifers. 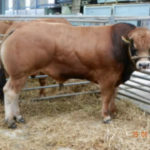 Due to the high cost of maintaining the suckler cow, it is essential to breed an efficient female, for cost-effective, sustainable, grass-based beef production systems.